When winter comes knocking at the door the only sensible thing to do is to head to the Rocky Mountains, where adventure is waiting for you around every curve of the skin track. The snow is sugary powder, the ice is blue and the mountains are beautiful, big and in your face. The area surrounding Golden is the perfect winter playground where you can ice climb one day, ski big backcountry mountain lines the next and then head for a fun day at the ski resort. We try to spend a few weeks in the Rockies every winter and this year we decided to spend a few extra days in the Golden area. Golden, as it turns out, is an incredible spot to set up base camp as you are within a 90-minute driving distance of six incredible national parks. With such close proximity to so much incredible terrain, there really is no end to the adventures that can be had. 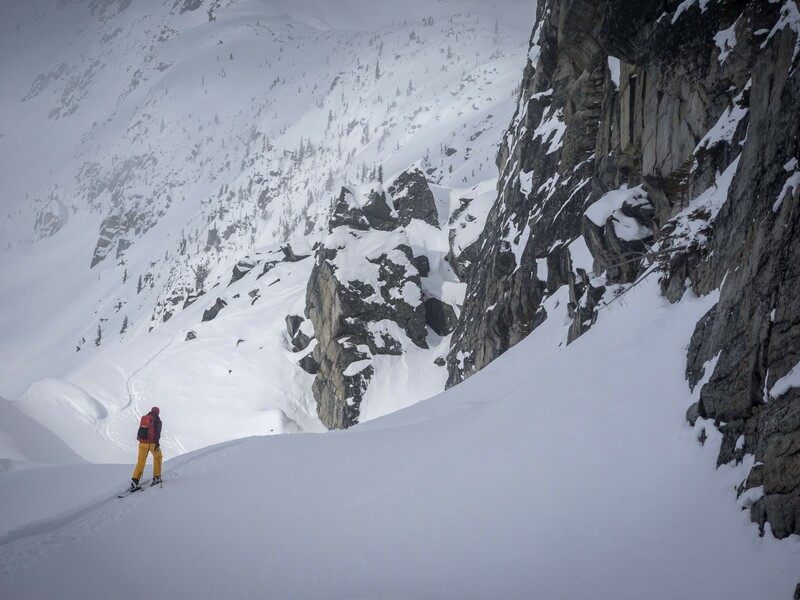 Some of our favourite winter activities are ice climbing and skiing so the natural elements surrounding Golden makes it easy to find adventure anywhere. We chose to spend one-day ice cragging at Haffner Creek. Located in Kootenay National Park it’s only a short 15-20 minute hike into the small canyon. Once in the canyon you will feel like you are in another world with curtains of blue ice clinging to the limestone rock. It’s an incredibly picturesque area to spend the day climbing short steep routes or even just to spend some time in an incredible setting. 2,588 Likes, 63 Comments - Leigh McClurg (@pebbleshoo) on Instagram: "There is something precious and special about interacting with these natural sculptures of ice,..."
The very next day saw us taking a short drive up to Roger’s Pass for some backcountry skiing. Once in the parking lot of the Discovery Centre, we spent a few short minutes signing in at the Parks office, and then it was skins on and head up. The beautiful thing about this area is that the climbs are big, but every single inch spent climbing up to the top of the ridge or peak is skied right back down to the highway. Every single turn we took in the legendary Roger’s Pass powder, as we descended, washed away each kick turn we had to make as we ascended. This day will go down as one of the best of the season so far. If you are a skier a trip to Golden wouldn’t be complete without a trip to Kicking Horse Mountain Resort, so we finished up the week with a visit here. You start the ride up the first chair and realize that just the views alone would be worth the visit, but then we hit the slopes and we were sold. Long, fast runs that take you top to bottom, in one single descent, gave us that satisfying leg burn and left perma-smiles on our faces. There really is only word to describe the small mountain town of Golden, BC...Awesome. In only a few short days we enjoyed some of the best skiing of our season, climbed some fun steep ice and got to enjoy the beauty of the Rocky Mountains. If you are thinking of heading to the Rockies in the Winter, or really any time of year, Golden should be one of your first stops. Cedar House Chalets is a beautiful set of modern, luxury chalets, nestled in the forest, a short 5-minute drive outside of Golden. Self-catered with outdoor hot tubs looking out at the surrounding mountains. These chalets offer comfort and convenience, with a feeling of seclusion right next to town. Jita’s Cafe is a great breakfast/lunch spot with plenty of options for everyone from curry to sandwiches. All made fresh to order with quality ingredients, you won’t be disappointed. Purcell Coffee is a cosy little coffee shop on the main street to fulfil all of your caffeine needs. Great Americano’s and a selection of sweet treats this is a definite must stop for an early morning or mid-afternoon cuppa joe. You can follow Leigh and Spring on their blog or via their Instagram and facebook accounts through the links below. Leigh and Spring are storytellers, outdoorsy nuts, photographers, happy campers, wanderers and sometimes adrenalin seekers. They believe in moving softly across the Earth with a respect for our wild places and their future protection. They are driven by curiosity and personal growth and enjoy feeling all warm and fuzzy when we stand on top of a new Mountain summit with friends.